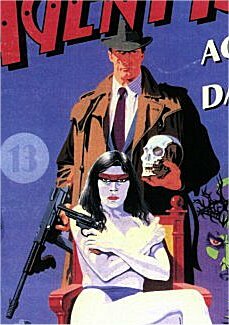 First Appearance: Agent 13 "The Midnight Avenger"
Powers/Abilities: Trained spy, expert in espionage and various fighting styles. History: Agent 13 was a man fighting a world-wide secret society in the 1930s. Other than knowing he starred in three books, a couple of graphic novels and a role playing game from TSR (The "Agent 13 Sourcebook" for "Top Secret SI") I don't know an awful lot about this character.